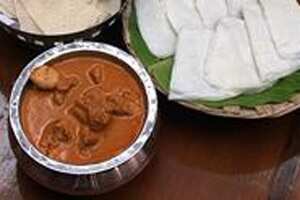 Saranya Hegde, author of ‘Mangalorean Cuisine’, shows us how to make a traditional chicken curry with coconut milk. Marinate the chicken with salt and turmeric and keep aside. Roast the red chillies, coriander, fenugreek, cumin seeds and peppercorns with a little ghee for 3-5 minutes. Add the grated coconut and garlic, and roast for 5 more minutes. Add the turmeric powder and make a fine paste. Heat half the ghee in a handi and add the masala paste. Put in the chicken and sauté well for 10-12 minutes. Add 100ml water, cover and simmer. Meanwhile, in a pan, heat the remaining ghee, sauté onions until brown and add the garam masala powder. Then add this to the chicken and continue to simmer for 20 minutes. Add the tamarind pulp and lemon juice. Finally, finish with thick coconut milk and adjust the seasoning. Temper cumin seeds in desi ghee and add to the curry. Serve hot with Neer Dosa or Kori Roti.